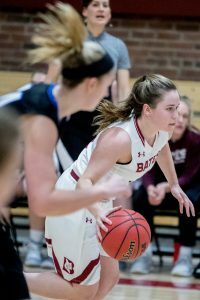 Julia Middlebrook ‘21 scored the game-winning three-point shot during the second overtime period, securing the victory for Bates 86-85. Throughout the game, there were many lead changes and momentum shifts. With only a couple seconds left in double overtime, down by two points, sophomore Julia Middlebrook ’21 made a three-pointer to put Bates on top 86-85. UNE was unsuccessful with their last shot at the buzzer, so the Bobcats rushed to the court to celebrate. The Bobcats were led by a surge of young talent. On the offensive end, first-year Meghan Graff ’22 led the ‘Cats with a season-high 17 points off the bench along with five assists. Graff got to the rim early and often. She shot an impressive 8-11 from the free throw line, leading the ‘Cats who shot exceptional from the line overall at 29-40 (72.5%). First-year starters Mia Roy ‘22 and Ariana Dalia ‘22 worked efficiently in their shorter time on the court due to early foul trouble. Roy added a season-high 16 points, shooting 6-12 from the field and 3-6 from beyond the arc. Dalia had a sweet stroke; she scored 14 points shooting 5-11 from the field and 2-4 from beyond the arc. She showed great control, fundamentals and a soft touch around the rim. The Bobcats’s bench was electric throughout the game. Cheering led by Carly Christofi ’20, Skye Conley ‘21 and Meredith Melendy ‘21 provided a sure home court advantage for Bates, in addition to the enthusiastic fans who came out to support the team. The essential skill of balancing many facets of life in harmony is referred to as “time management.” For the majority of college students, time management proves to be a difficult and stressful task. Balancing friends, significant relationships, schoolwork, class time, and extracurricular activities can often feel challenging, if not impossible.